There is a gremlin within you. He is the narrator in your head. He tells you who you are, and he defines and interprets your every experience. He wants you to feel bad, and he pursues this loathsome task by means of sophisticated maneuvers: just when you feel you’ve out-argued or overcome him, he changes his disguise and his strategy. He’s the sticky sort — grapple with him and you become more enmeshed. What he hates is simply being noticed. That’s the first step to his taming. If you have a low tolerance for self-help books or they haven’t worked for you, here is a more creative yet practical approach to solving life’s problems. 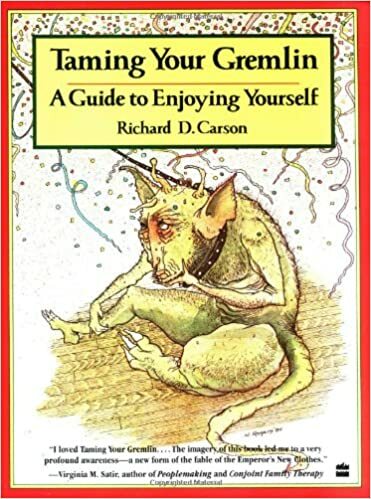 Through the powerful metaphor of the gremlin, presented so imaginatively by Richard Carson’s writing and Novle Rogers’s artwork, you will find ways to identify and banish the tenacious, self-defeating aspects of your personality.